So, I have been experiencing this rash on my groin or rather the area where my thigh meets my groin on and off for about three to four months now. The skin rash starts off flat and semi round and pink in color. It is not clearly round and turns into a raised raw bright red area that burns or better yet lightly stings as if I got a minor burn! The rash isn't super bothersome and goes away after a day or two but comes back within a one to two week period. I have tried to establish a pattern as to what causes the rash and when the rash occurs but I have not found one! I have no health insurance and would appreciate whatever help I can get. A few other notes that may help with the diagnosis is that I am a female and I am 23 years old. I have had the same sexual partner for five years except for a six month separation. In between we have been tested and therefore do not believe the rash is related to sexual activities. 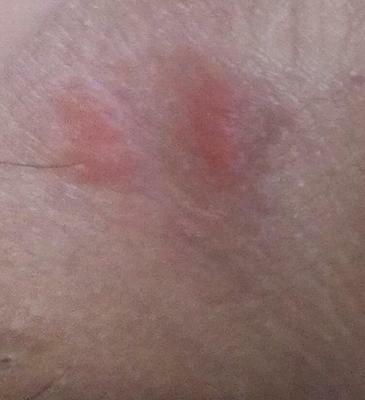 I have attached a couple of pictures of my pink raised groin rash to also help identify what this could be.